Southwest monsoon further advanced into some more parts of Gujarat region, some parts of East Rajasthan, remaining parts of Maharashtra, Chhattisgarh, Odisha, Bihar and Jharkhand, entire Madhya Pradesh & East Uttar Pradesh; most parts of West Uttar Pradesh, Uttrakhand & Himachal Pradesh, entire Jammu & Kashmir and some parts of Punjab. The Northern Limit of Monsoon passes through Lat. 21°N/ Long. 60°E, Lat. 21°N/ Long. 65°E, Veraval, Amreli, Ahmedabad, Udaipur, Sawai Madhopur, Aligarh, Tehri, Una and Amritsar. Conditions are favourable for further advance of Southwest Monsoon into remaining parts of Rajasthan, West Uttar Pradesh, Uttarakhand, Himachal Pradesh and Punjab and entire Haryana, Chandigarh & Delhi during next 48 hours. 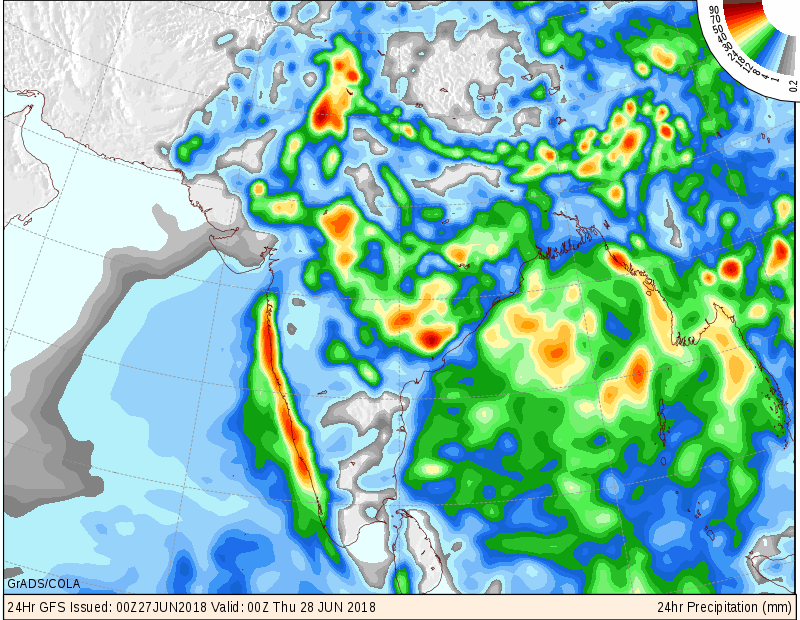 Pre­monsoon thunderstorm activity is very likely to continue over remaining parts of northwest India during next 24 hours. The East­-West trough at mean sea level now runs from West Rajasthan to Northwest Bay of Bengal across North Madhya Pradesh, Jharkhand & Odisha and extends up to 1.5 km above mean sea level. The off­s-hore trough at mean sea level now runs from south Gujarat coast to north Kerala coast. There is UAC over South Pakistan & adjoining West Rajasthan and extends up to 0.75 km above mean sea level. The earlier UAC over Gujarat region and adjoining Southwest Madhya Pradesh at 3.1 km above mean sea level now lies over West Madhya Pradesh & adjoining Southeast Rajasthan. There is a UAC over coastal Odisha and adjoining areas of Northwest Bay of Bengal & West Bengal and extends up to 5.8 km above mean sea level titling Southwestwards with height. The Arabian Sea branch of Southwest Monsoon is stand still for last few days. 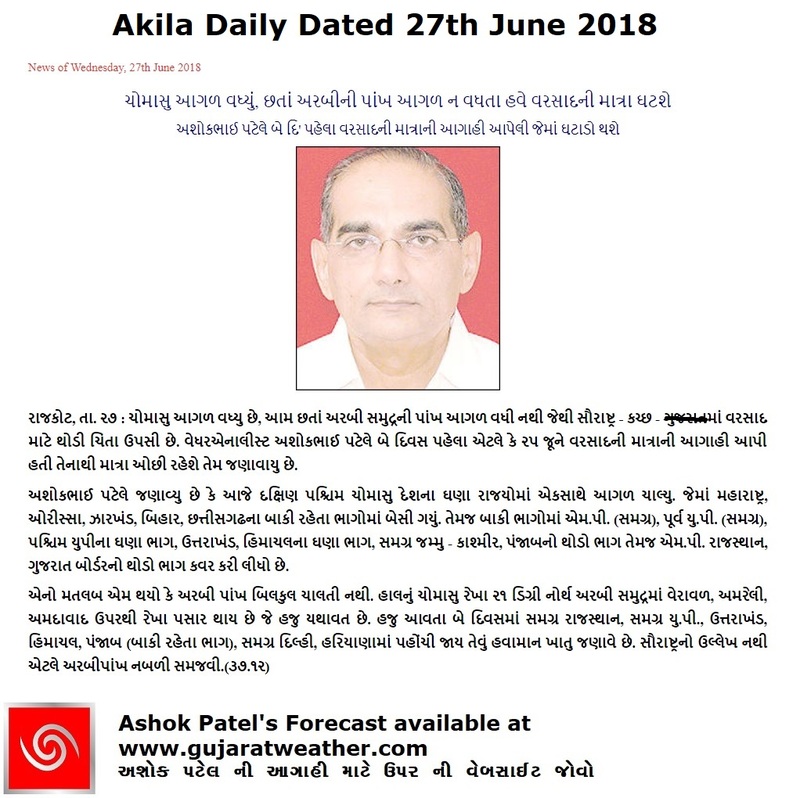 Forecast issued on 25th June 2018 up to 2nd July will have lower forecast out come. 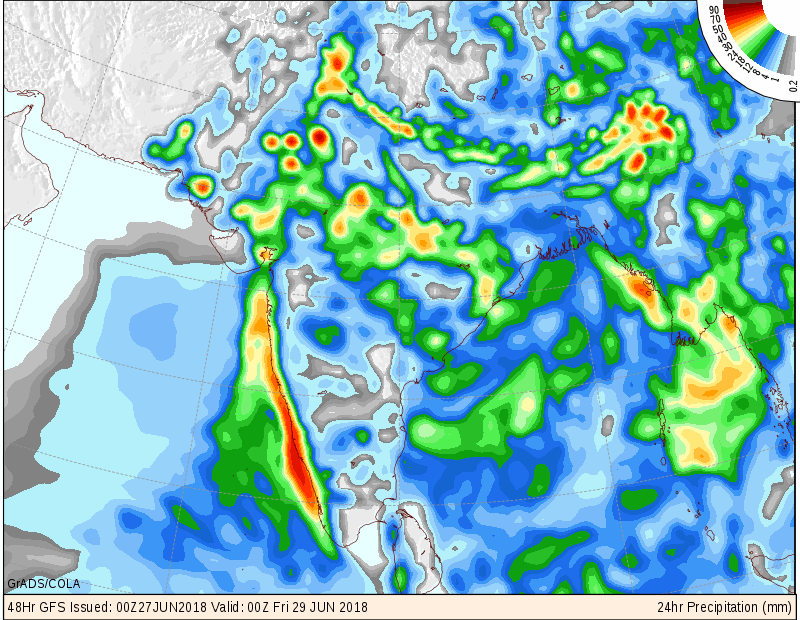 Rain quantum for combined region of Saurashtra & Kutch could be less than earlier forecast during the rest of forecast period. આગલુ યુએસી હાલ પશ્ચિમ એમ.પી. 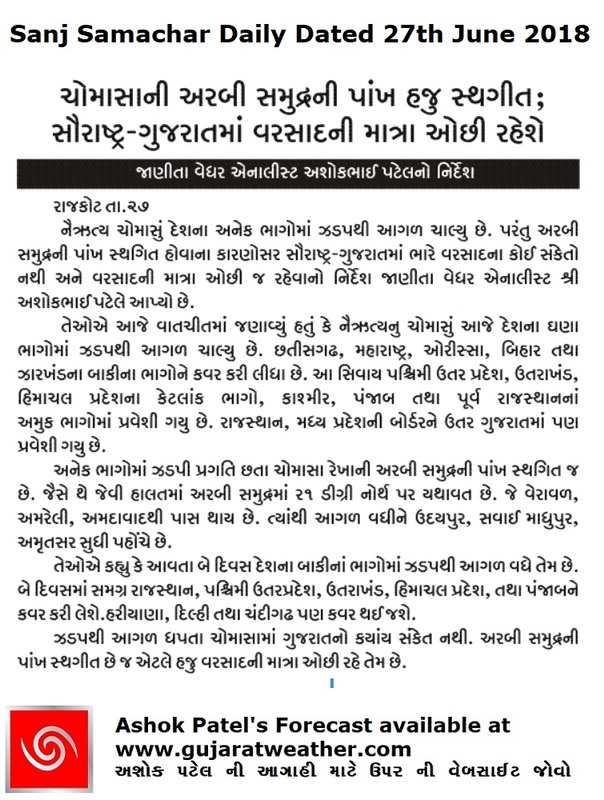 અને લાગુ પૂર્વ રાજસ્થાન ઉપર 3.1 કિમિ ઉંચાઈ એ છે. એક યુએસી દક્ષિણ પાકિસ્તાન અને લાગુ પશ્ચિમ રાજસ્થાન ઉપર છે 0.75 કિમિ ઉંચાઈ એ. મોન્સૂન ટ્રફ યથાવત દક્ષિણ ગુજરાત થી કેરળ સુધી લંબાય છે. બંગાળની ખાડી વાળું યુએસી હાલ ઓડિશા અને લાગુ નોર્થ વેસ્ટ બંગાળ ની ખાડી આસપાસ છે અને 5.8 કિમિ ની ઉંચાઈ સુધી ફેલાયેલ છે. આજે ચોમાસુ દેશ ના મોટા ભાગો માં આગળ ચાલ્યું છે છતાં ચોમાસા ની અરબી પાંખ હજુ સ્થગિત રહી છે. સૌરાષ્ટ્ર, ગુજરાત અને કચ્છ માટે તારીખ 25 જૂન 2018 થી 2 જુલાઈ સુધી ની આગાહી આપી હતી. સૌરાષ્ટ્ર અને કચ્છ ને સાથે ગણી તે આગાહી ના બાકી રહેલ દિવસો માં આગાહી કરેલ વરસાદ ની માત્રા ઓછી રહેવા સંભવ છે.